In Colossians, chapter 1, Paul depicts Christ as the redeemer (14), the creator (15-17), and the head of the church (18). He concludes, "That in all things he might have the preeminence. For it pleased the Father that in him should all fullness dwell" (18,19). The church has a divine head, Jesus Christ her Lord. This simply means that Christ rules over her. The church is not a monstrosity - it is not a many-headed body. It is one body with one head. Christ does not share his rule or authority with man. This being true, it follows then with all the force that reason, logic, and Scripture can have, that the church has no human head. Any man who claims to be the head of the church, either in heaven or on earth, makes a false claim and seizes for himself a prerogative that belongs to Christ alone. Christ is not only the divine head of the church, he is her only head. Christ is the head of the church, which is his body (Col. 1:18; Eph. 1:22-23). It would be an incongruity for a human body to have a divine head, or vice versa . The conclusion is therefore inevitable that the church is a divine institution. The church is divine because she was conceived in the mind of God (Eph. 3:10, 11), foretold by the prophets (Isaiah 2:2-4), built by Jesus (Matthew 16: 16-18), purchased with his blood (Acts 20:28), and constructed under the immediate direction of the Holy Spirit working through the apostles of Christ (Acts 2). This divine institution is made up of all the saved (Acts 2:47); has for her mission the salvation of lost souls (Mark 16: 15-16; and God's divine law, as revealed in the New Testament, is her only rule of conduct (2 Timothy 3:16, 17). 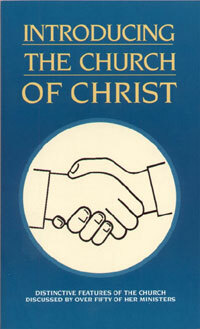 Every member of the Lord's church is a member of a divine institution. This should be contrasted with modern denominations, which are human in origin, name, doctrine, organization, and practice, have human heads, and are ruled by human laws. Since the church follows only the instructions given by her divine head (through his divine word), all her practices are divine. The way of God is far above the ways of man (Isa. 55:8,9) and it is not in man to direct his own steps (Jeremiah 10:23). This means that every action must be directed by the Scriptures - every act must be an authorized act (Col. 3:17). Paul stated this principle clearly when he said, "Prove all things; hold fast that which is good" (1 Thessalonians 5:21). This simply means that if a thing cannot be proven (by the Scriptures), it cannot be practiced. If one holds fast only proven things, then it necessarily follows that he must reject everything not proven. All directions must come from the head. Because Christ is the head of the body, which is the church, Christ and the church are inseparably joined together. Christ works through his body and the body does the work of Christ (cf. 1 Corinthians 12:12-27; Eph. 4:11-15; 1 Peter 4:8-11). This makes it impossible to reject the body without also rejecting the head, "From which all the body by joints and bands having nourishment ministered, and knit together, increaseth with the increase of God" (Co. 2:19). Christ cannot be received apart from his body. Do the Scriptures teach that Jesus is the head, and the only head, of the church? What is the significance of this? Why is it vital to have a divine rather than a human head? How may we know that the church is a divine institution? Who is the divine source of authority for the church and how does he exercise that authority today? Why is a divine head (who never dies) superior to a human head? May one reject the body without rejecting the head?